We’re off on an escapade! 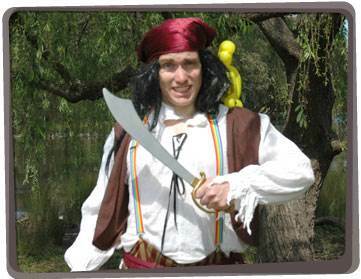 Share in our exciting exploits and let one of our fabulous pirates for hire in Melbourne come aboard for your next kids pirate party. They’ll be thrilled to share their treasured delights! We do everything to give your children the most wondrous experience they could imagine. They’ll be talking about it for days. Our Yabadoo Pirates for hire bring a range of fun pirate party ideas including a magic show full of giggles, balloon modelling, funny props, fun pirate party games (as well as pass the parcel) plus more. 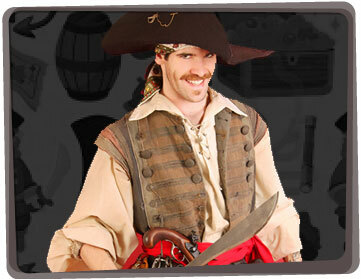 Our scoundrel of the seas can even face paint the children while they’re eating their pirate party food. To make sure your birthday child is aware they’re special, they’ll be given a special modelled balloon seaman’s hat and balloon sword during the magic show. Our Yabadoo entertainers are experts at spreading smiles and have lit up the faces of thousands of children at large functions such as company parties and council events to preschool performances and christenings. 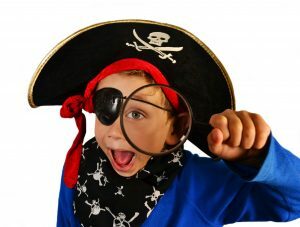 If you are having a pirate themed birthday party in Melbourne or any other kids events, give the swashbuckling laugh experts at Yabadoo a call! This fun pirate game idea is best played in the summer! The kids will definitely be kept busy whilst the entertainer is still arriving. Fill up lots of balloons with water. Each pirate chooses a partner. Have them stand facing each other about half a meter away in distance. The pirate throws the water balloon to his/her pirate partner whilst shouting “Aye aye!” His/her partner catches it. If the balloon has been caught without getting popped, then both pirates take one big step backwards and throw the water balloon again. The pair who throws the farthest distance without bursting their balloon wins.